Coming up at The Waterside we’ve got our New Year, New Games special in January, followed by our Valentine’s special in February and our March Madness special in, err, March. We’ve also got shows at The Way in Atherton this month and we’ll be back at Ramsbottom Civic Hall in February! If that’s not enough comedy for you’ve then there’s Improv Mullet and the return of the New Adelphi Comedy Night. Fancy having a go at this improv malarkey yourself? Workshops return 16th February and we’ve got a couple of spaces left. Head over to our workshops page to learn more. We’re also planning our 2019 Edinburgh run as well as plenty more surprises for the year to come. We can’t wait to share them with you – never miss an update by following us on social media or signing up to our mailing list today! Jan 19th, 3pm – ComedySportz 4 Tots, Waterside Arts, Sale. More BIG laughs for little kids with plenty of silly songs and stories. Join us for an afternoon of laughter and fun for kids aged 6 and under. £5/3. Book online or via venue box office. Jan 19th, 6.30pm – ComedySportz, Waterside Arts, Sale. New Year, New Games special! We’ll be road testing some never seen before games (or some never seen again ones) as our teams battle it out for your laughs! Who wins? You decide! £7/5. Book online or via venue box office. Jan 26th, 6pm – ComedySportz, The Way Theatre, Atherton. Two teams battle it out for your laughs with quick-witted gags, games, sketches and songs. All inspired by your suggestions! £8/5. Book online or via venue box office. ComedySportz at Piece Hall this Christmas! We’ve got one final festive treat lined up for 2018 with two shows in the fabulous Spiegeltent at Piece Hall in Halifax! Never seen a ComedySportz match before? Two teams will battle it out for your laughter using quick-witted gags, games, sketches and songs inspired by your suggestions. There’s a referee on hand to ensure a good clean match – it’s a family friendly show after all – with penalties for bad behaviour and bad jokes. The show is lots of fun for all ages, from chuckling children to giggling grandparents. As it’s Christmas time we’ll be sure to throw in a few festive themed games. There will also be plenty of opportunities to get involved in these all action, all improvised comedy shows. So if you’re looking for something to do with the family over Christmas you don’t want to miss ComedySportz at The Piece Hall! Please note: Fees may apply if booking online. 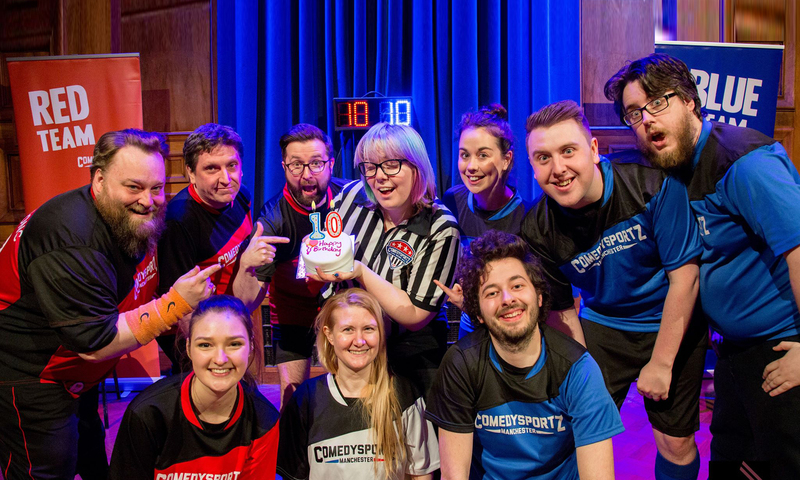 We’re only a few weeks away from the return of the ComedySportz Improvised Pantomime! OH YES WE ARE! Each show will be a completely new adventure created from your suggestions and a little sprinkling of fairy dust. There will be heroes, villains and what we lovingly refer to as songs in this fond pastiche of the nation’s favourite Christmas show – we might also throw in a few ComedySportz games for good measure. There will also be plenty of opportunities to join in to help our heroes win the day… and every good villain needs a henchman! Our improvised pantomime proved a real hit with audiences at the Waterside in 2017 and we’re delighted to be back with more shows and more venues. With shows across Greater Manchester, there will be plenty of opportunities to catch these fantastically festive shows that are an alternative Christmas treat that the whole family can enjoy! Please note: Fees may apply if booking online. You can also purchase tickets via venue box office. *The 3pm show on Saturday 15th December replaces our regular ComedySportz 4 Tots show. However, this show will still be aimed at younger audiences aged 6 and under.